Laine has worked in both the traditional and digital marketing industries for more than 10 years, a blend of “old school” traditional marketing knowledge meets new digital spin. She is a self-described “nerd” and loves figuring out the ins-and-outs of how marketing systems talk to each other, while also building that important business relationship with people. She prefers quality over quantity, which motivates her to set up the very best operational system and strategy for organizations. Laine grew up in Syracuse, NY. She graduated with a Bachelor’s degree in Marketing and Computer Applications from St. John Fisher College in Rochester, NY, while simultaneously becoming Certified in Graphic Design from the Rochester Institute of Technology (RIT). She then moved to NYC for 8 years developing her career and real-world (read: tough-world) skills. 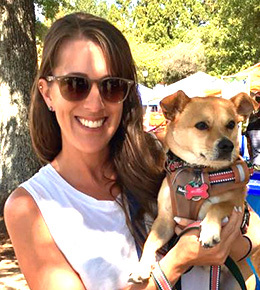 She relocated to Atlanta in 2013, where she completed her Salesforce/Pardot Specialist Certification and obtained a Digital Marketing Certificate from Emory University. In her spare time, you can find her anywhere from sitting poolside, to the golf course, to a concert, to strolling around the park with her dog and/or trying new restaurants with friends. Diagnosis: Sun-worshipper trapped in city life who wants to do everythinggggg and there’s just no time! Self-medicates with: Fitness classes, running, Netflix binges and all the other things she’s addicted to!